I started a class this week called, Administration of Special Programs, Grants and Mandates. I’m sure you are thinking that that just sounds riveting. Well, even though I have already had a lot of experience with much of the content of the course, I do enjoy delving deeper into topics I’m familiar with in an attempt to discover more about that topic. Anyway, our homework had us looking at gifted education and that got me thinking. Federal funding has been cut dramatically over the past decade for gifted and talented education. Districts have to rely on grants to fund programs. Also, very little professional development is given in the area of gifted and talented. I feel that the programs that are put in place for gifted and talented students would really benefit all learners. Aren’t we all gifted and talented in our own unique way? The practices of pretesting and then compacting the curriculum, increasing the number of fieldtrips and differentiating instruction would benefit all learners! So, what does this have to do with children’s books? 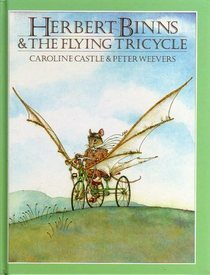 Well, a good family friend gave me a copy of Herbert Binns & The Flying Tricycle by Caroline Castle and Peter Weevers this week. And, it fits nicely with our gifted and talented topic! Herbert Binns is a small little mouse, but very intelligent. He loves to invent things including a flying tricycle. Throughout the story, Herbert is teased or some would say harassed by other animals who are jealous of him. Herbert remains strong and confident and perseveres with his passion. I love the message of the story. I think it’s important to read books to children that play on the character’s strengths in difficult circumstances . The watercolor illustrations remind me of the Peter Rabbit books. This is an older book and is out of print, so try to find it at your local library. Enjoy!